Simple Versatile Cowl - Free Crochet Pattern - love. life. yarn. It has still been unseasonably cold here in Tennessee. We missed the big southern snow that came this week, but we did not miss the single digit temperatures that accompanied it. I wanted something to keep my neck warm but didn’t want to take the time to whip up an entire scarf. Hence the Simple Versatile Cowl was born. One day when it was not too cold out my family and I went out for a walk at a local park and I took all kinds of pictures of myself wearing this cowl. I love it! 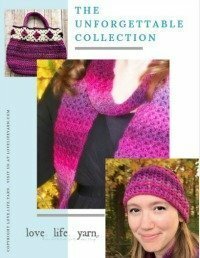 This is exactly what I was looking for in a neck warmer – simple to make, fun to wear, and looks great. As you can see I took lots of pictures while my husband and sons were busy at the park. It was a fun day! I am still finding new ways to wear it. With this weather, I have definitely been getting a lot of use out of this cowl! *Note: While this is the yarn I used, it will not take anywhere near the entire skein or even half. Any worsted weight yarn would work. Ch 96. Join to first ch with sl st, being careful not to twist. Round 1: Ch 1. Sc in same st as join, ch 1, *sk 2 ch, V-St in next ch, ch 1, sk 2 ch, sc in next ch, repeat from * to last 5 ch, sk 2 ch, V-St in next ch, ch 1, join with sl st to first sc. Round 2: Ch 4 (counts as first dc and ch-1), dc in same st, *ch 1, sc in center ch-1 sp of next V-St, ch 1, V-St in next sc; repeat from * to last V-St, ch 1, sc in center ch-1 of last V-St, ch 1, join with sl st to 3rd ch of first dc. Round 3: Ch 1. Sc in ch-1 sp of first V-St, *ch 1, V-St in next sc, ch 1, sc in center ch-1 sp of next V-st; repeat from * to last sc, ch 1, V-St in last sc, ch 1, join with sl st to first st.
Repeat rounds 2 and 3 until piece measures 6 inches. Fasten off. Try on cowl and decide upon button placement. Sew on button.